The decision was made with difficulty. We would Head for Pobeña tonight and the donativo albergue. 1K short of Arenas but at least we would, hopefully, get a bed. We had our cold coffee and choc brioche, so we were good to go. It was a pleasant day, we were early and we only had a short walk of about14k. We set off along the shoreline, knowing that at some point we must head inland. Straight away people were telling us we were going the wrong way. 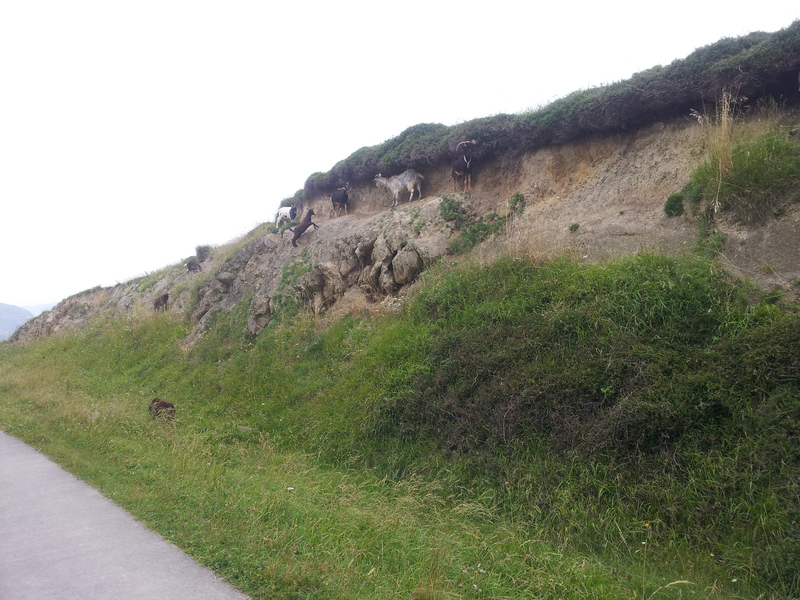 As we got further along one guy was quite insistent but we ignored him. Seems he had a point though, because another guy told us that this path “no hay salida” and we could not get through. We turned back a short way and then, using the GPS worked our way through a dormitory estate of flats and houses. Eventually we got back onto the N634. Soon enough we encountered pilgrims again and had to assure them that they were going the right way. When we got to where the road twisted and turned we met more coming up from a valley. We followed their backtrack and recognised where we were. Lower down we were still following the arrows backward and no longer recognised the path. 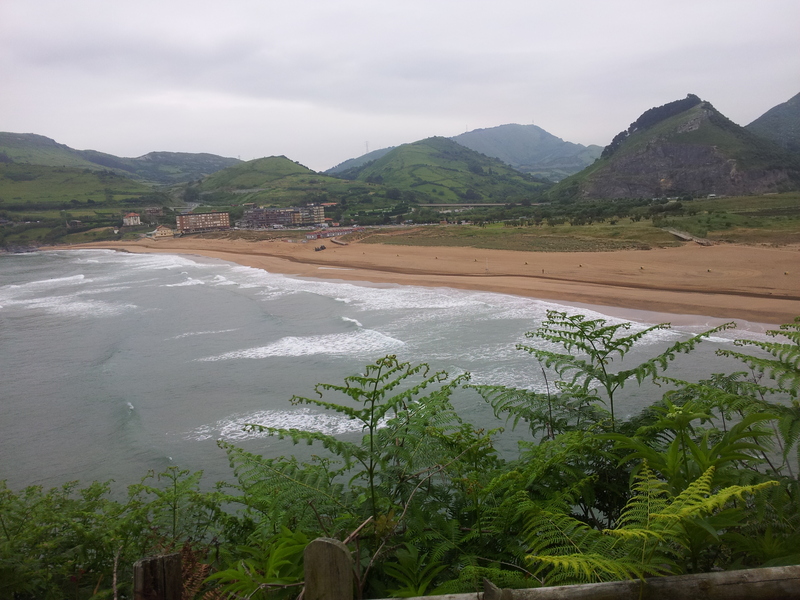 We came to Playa Mioño. The book has two paths to take here so we were still on course. The beach itself was the filthiest place I have come across. There were a number of vans parked up and litter had been left everywhere. On the path up out of there was further rubbish and human faeces, it was disgusting. Of all the places we have visited, I have no desire to return here. Back on the N634 we encountered more pilgrims and noticed that they were missing the turn down. I had no desire to put them right. They would be happier on the road. Behind the pilgrims came a bus, the driver slowed right down and gesticulating wildly indicated we should turn around and go the other way. When we got to the turn off in Onton, the waymarks had been vastly improved. So much so that, when we had come this way we had to ask directions, now we could easily follow the arrows backwards. We easily found our way onto the old railway casement, but halfway along was a fence with a sign not to pass as it was closed. Unsure of what to do we waited then saw people coming the other way. So we just ignored the signs and carried on. 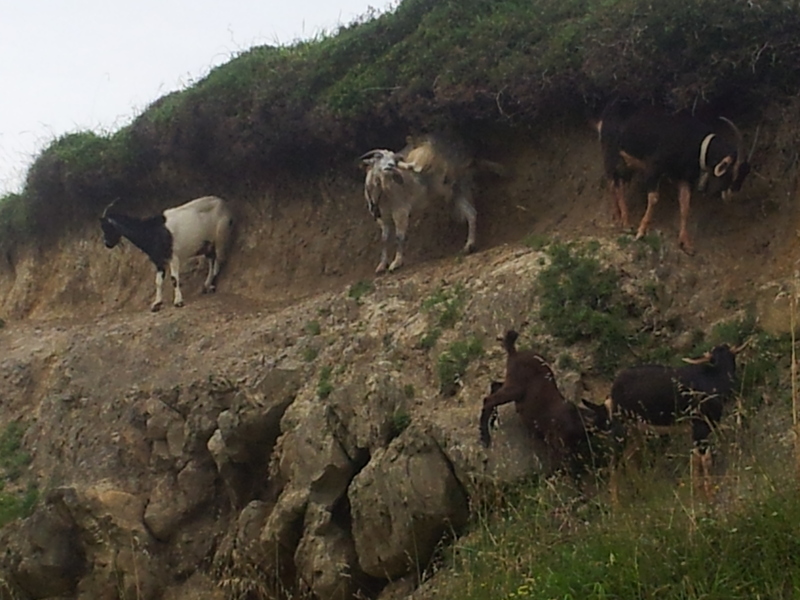 There were some signs of a rockfall but nothing to worry us, another unnecessary diversion avoided. It was still early when we arrived at the Albergue and the hospitalerios were just locking up and leaving. A young couple said that we should leave our bag in a queue by the door. Viv was concerned that such a nice day we could have got our clothes dry. I said not to worry follow me. Behind were sinks and lines, so I changed my shirt and we washed our socks and shirts and left them to dry in the sun. We got talking to an Austrian guy who was here on his own, his wife unable to walk with him. Then we went off for some pinchos and cañas in the village. We were right by the bus stop for Bilbao and were tempted, but no telling if we could get a bed. The young couple who had helped were camping outside and, it appeared were volunteers helping at the albergue. Once we were ensconced in the albergue we walked on to La Arena and had one of their wonderful rice dishes and more beer. It was a little expensive, but worth it. We also got some stocks in the supermarket for the morning. This place is for rich people with apartments so the choice for us was not good, still better than nothing. Viv said that she was not going to allow the early risers to disturb her in the morning, she would lay in bed until they had all got up and gone. The way out of Laredo should have been easy, it was not. We could not find the steps we had come down when we first arrived and we ended up in a steep narrow country lane. There were arrows here though, so we continued to back follow them. Steep rugged and narrow, the roads were not maintained and almost impassable for vehicles. There were a few abandoned houses and we could see why no one would want to live here, despite the views. The GPS was now telling us we were going the wrong way, it was time to look at the mapping and make our own route. It was back on ourselves and also with the camino. Then we came across a T junction and again we were going against the arrows. Then we came to the N263. 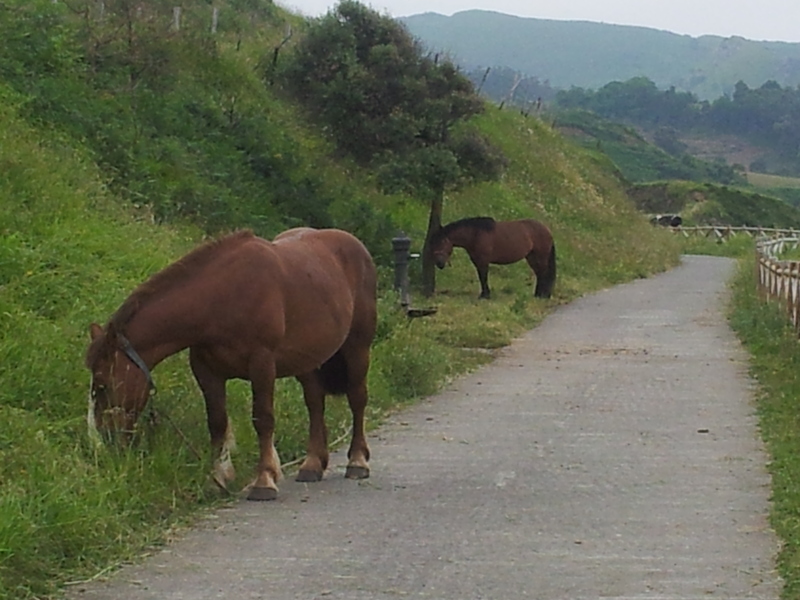 This was the point where Pat had wanted to follow the camino, but instead had decided to follow us. We could now see this had been a wise decision. At the junction to Liendo the road was closed, I was not intending to go that way anyway. On our way down we had done 33k and now we had done the extra bit on the end, “stick to the road” I thought or this would be a marathon day. At a roundabout we stopped for Viv to adjust her pack and a group of Italians arrived. They asked if we were lost, we told them we were headed back and they asked “Why” “Well we need to go home some time” I said. As they left we realised we were right by a bar, but it was closed. Just within sight was a garage, we had seen the Italians go toward it then turn away, but we tried anyway. They had coffee, kitkats and even a seat for us. It was a long day short of stopping places, we left the N263 in Cerdigo, but the bar where we had met Patrick was closed so we just carried on. 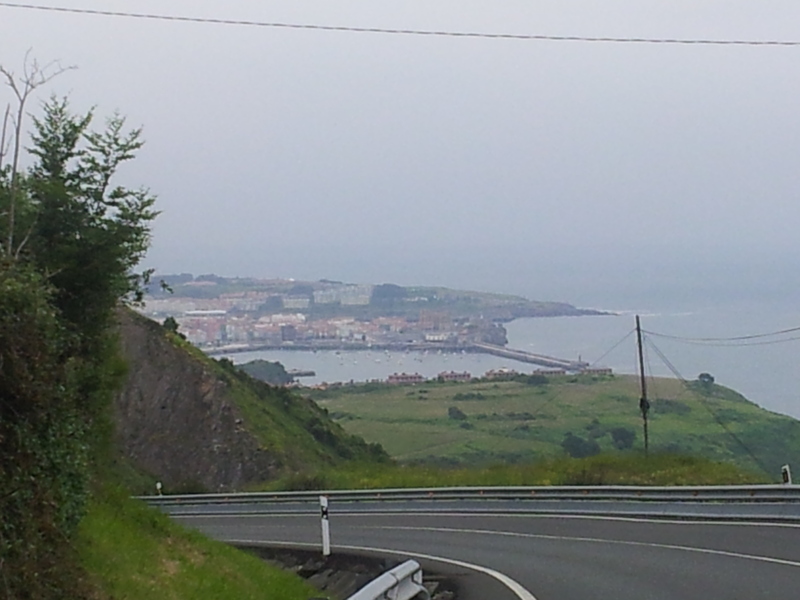 As we entered the outskirts of Castro Urdiales and passed the Bull Ring and albergue we also passed a line of shops. There was a kebab bar, no alcohol bur two cokes and a sit down for 2e. Shame I cannot persuade Viv to come back later to eat. Surprisingly again we got a room in Hostal Del Mar and there was availability for tomorrow as well. The only free room was ours, luck was on our side. There was no outside line and poor internet. I was now getting nervous about accommodation. So I rang a head to Playa de Arenas. 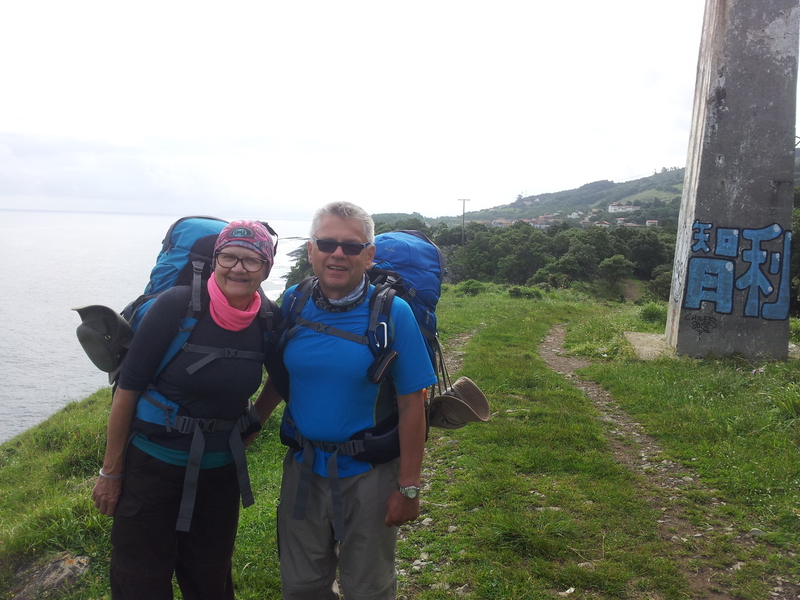 There is only the one place to stay there so if it was full we would have to walk on almost to Bilbao. It was full for the whole weekend, the only room they could let us have would be tonight. So I took my option on another night here and considered my options. We ate salad from Eroski (local supermarket) and had some beers in the bar across the street. The following day was a beautiful hot day. It would have been totally unsuitable for walking so we just enjoyed it. We ate breakfast in the chino bar by our hostal, even staying for extra coffee. Lunch was a collection from the panaderia, this was the same chain that we had stopped at in Laredo, but with different things for sale. Interestingly we stopped here on our first time through for breakfast. Seems like all of Spain was stretched out on the slipway here so after exploring the ruins, we joined them. Viv was first to brave the water, but unknown to her, the tide was right on the edge of the actual slipway. I watched her gingerly walking down to the waters edge then suddenly disappear into water. I was not very brave, unsure of the bottom, so although I went in did not go far or stay in long. If you want food at a reasonable time, it seems Burgerking is the way to go. Well first of all they had a sign on the door “No hay Ternera” so ok we will have chicken. They were advertising “Menu Barbacoa ” so I asked what it consisted of. It appears young girls with tattoos and piercings are incapable of answering a simple question. No doubt this is advertised on the local TV, but we are tourists after all. Anyway we got the menu but not the Barbacoa and we had two empty cups. No one told us that there was a drink dispenser by the door, I had to work that out by myself. I think we should have waited and gone to the chino instead. I did think of filling our cups with Ice to go, to cool our coffees for the morning, but decided against it. We finished the evening in our favourite bar with some cañas of San Miguel Selecta. The camino sent us a different way out-of-town from last time. We missed the bars that I knew but we still managed to find a place selling croissants and coffee, so unlike yesterday we would not have to wait two hours for breakfast. We passed the bullring on the way out and the albergue, I had seen it advertised now I knew where it was. The road now became a series of roundabouts so I decided to cut left into an estate and hopefully avoid the snarl up. We came into a cul-de-sac and had to back track. Then following the GPS we came to an underpass. A guy in his garden told us that this was a “safer” route. Although the path weaved for a while, it soon followed the main road, but at a distance. We passed under the road a few times eventually coming out in San Isidro. 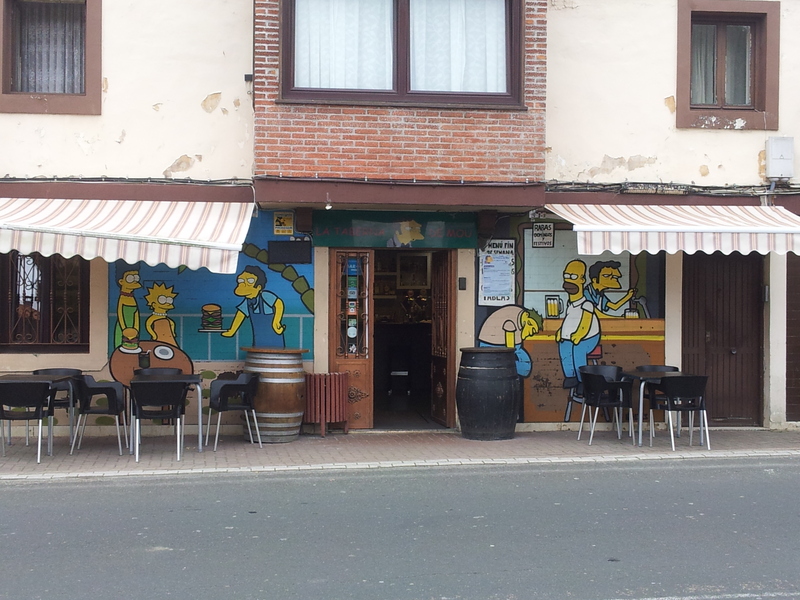 There there was a sports club with a bar where we had stopped on our last camino, so we stopped for another coffee. We were joined by an Irish guy called Pat and we sat talking. We left the bar together and he stayed with us the rest of the day. This was a 70th birthday present from his wife, who was pre booking his stops ahead of him. He had actually stayed at the same place as us last night, but we did not meet. It was a long and arduous day, so Pat was glad of the knowledge we brought with us cutting down some of the unnecessary bits. I suppose it is easier to talk to strangers and he told us all about his life as a property developer and how he lost £16.1million in the crash. I think of myself as relatively poor, but then my life, home and savings have never come under threat. Pat’s map had a different route through Liendo, ours shows two routes around it. We ended up in there anyway and there were no bars to be found. Again there were two routes out and we made the fatal mistake of asking a Spaniard. That helped not at all, so we took the route that my GPS directed us. We then got to the main road. Again Pat had another route but said “I’ll stick with you” and so we arrived at the series of steps that took us down into Laredo. We were going no further today so Pat bought us a drink as reward for our company and help. He was booked into the Hotel Cosmopol and we set out to find something cheap. We found a place called Hotel Ramona. It looked a dump, but inside it was nice and only 30 euros a night. The morning walk across the beach is a joy. A complete absence of people except for the guys cleaning the beach. It’s peaceful and fresh until we get to Pobeña. It is only just over a kilometre away but then we have to climb those steps. It does not say in the guide-book, but I think I counted over 120 of them. From here on though it is level for 6k as we are walking on an old railway casement. I notice that the old ship loading station is now signed as a castle and we are routed upwards away from it, I wonder why and make a note to check on our return. We go through a deep cutting where we are warned of falling rocks, although it looks ok to me. Then a tunnel where we are protected at each end by a further tunnel of wood, from more rocks. We leave the railway and dodge under a large road and take a steep footpath down to Onton. After this we climb again out of the village and spot a garage on the Road. I thought we would miss this but we loop right around and come out at a roundabout right net to the garage. I remember this now, from two years ago. Inside they have a coffee machine, only a domestic one and they have no potable water and so bottled water is used, but for only one euro each we finally have coffee. After another two or three k we come across a hotel on the hilltop. We stop for a proper coffee and a well-earned rest in a place called Saltacaballos. 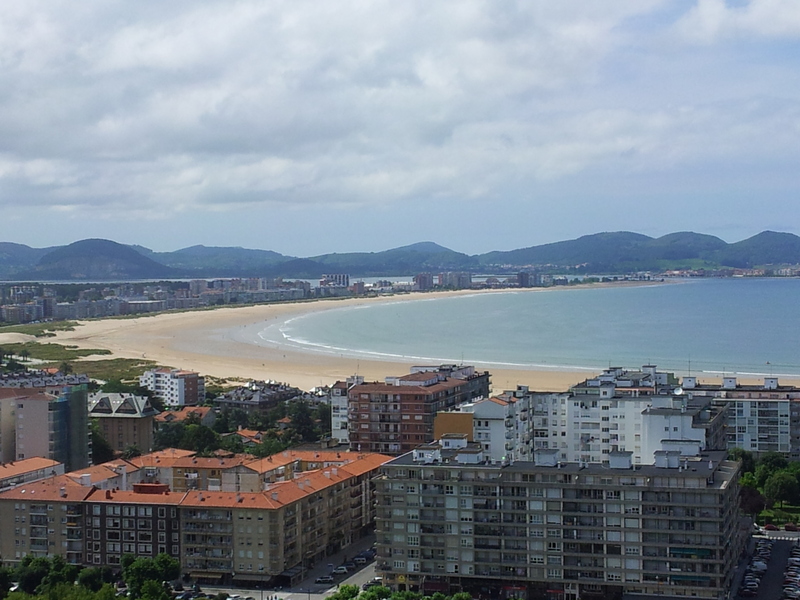 The beauty of repeating some parts is that we know just where to stay and Castro Urdiales did not disappoint Hostal La Mar was as comfortable as last time and we did not have to search. Here already we start to run into the usual problems, no food until eight. We managed to find one bar open at seven-thirty but then the football was on at eight. Life ain’t easy for pilgrims even if you do stay in hostals. There was little point in doing all the pilgrim stuff as we have already visited the church here. So we just relaxed with a beer and enjoyed the view and the antics of the boaters. As I watch them I can’t help thinking “been there done that” now definitely a landlubber. As we head out of town it seems to take an age to get to the turn off for the alburgue. (The official end of yesterdays stage). We did find a good café before we left town though, and stocked up on croissants and coffee. We have beautiful coastal views here for 8k until we arrive in Islares.Time to refill with coffee and a short rest before we carry on. After this we are on road again until a fork in the road and we have another split in the route ahead. We decide to take the shorter route, it involves more road, but today is long enough. Finally we descend another load of steps down into Laredo. We are surrounded by bars, it is difficult to decide which one to choose. We pick one that has a view of the camino and a seat in the sun. I have a new favorite beer, it is called Selecta by San Miguel, of course. As we sit here with our beer and pincho we are passed by dozens of fellow pilgrims. The two Swiss girls pass, they are not travelling on, they are stopping in the alburgue here. Rested and refreshed we carried on just a short walk to the ferry now. 5kilometers further on and still we have not reached it. We are tempted by the hotel at the end but then we see a line of cars and think this is it, but no. Eventually we come to a large circular area with cars parked and some bars. We see a sign for the ferry and we follow a boardwalk then we are on the beach. It is only a foot ferry and it was about to leave. The engines stirred up the sand and we thought he was going to leave us there, but he was just moving the boat to make it easier for us to get on. At the other side there was a tourist information point, but you guessed it, it was shut. 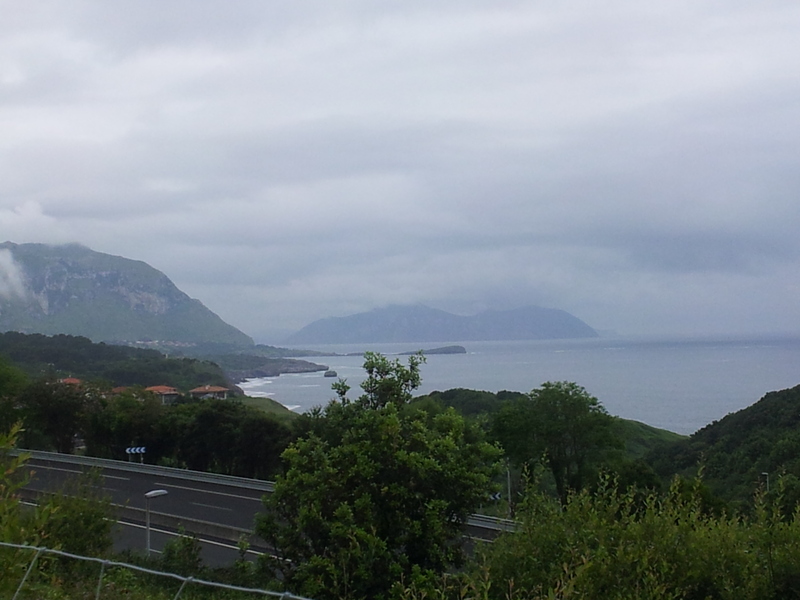 Santoña is not a big place but we struggled to find a hostel. We found another information point “Open at 5:30” but it did not. So we continued our search. Then we came upon a Pension attached to a bar. “Lo siento es complet” he said “English?” “si” said I. “I have a friend who has a new pension, I can ring him for you” So we waited and enjoyed a free beer (The best kind). When the guy came we followed him through a maze of streets to our new home for two days. I always worry at this point as they are always reluctant to discuss the price. I need not have worried 35e including breakfast. It was a beautiful room, but unfortunately no balcony to dry our things. We tried to find a launderette but it seems it was quite a way away still we could try tomorrow. Meanwhile our host was busy in reception, so I thought give it a try “Hay servicio lavanderia?” “Si un bolsa 5e” that will do for me. We threw everything we weren’t wearing in a bag and took it to reception. Next morning, as this is a rest day we got up at a civilized time and went around the corner for breakfast. The guy in the café was a nice guy but it was like pulling teeth getting anything off him. Everything was included but we had to ask for each item individually. We checked the opening time for the morning 7:30 later than we would like but OK.
We walked down to the front and bumped into the Swiss girls again. The first ferry is at 9:00 but it was now well after ten, seems they are not early risers. We spent the day exploring and looking out for pilgrims, though we saw no one else we knew that day. The castle was well worth viewing, they had an exhibition on there but I was more interested in it’s strategic significance. It was the only place where Napoleons army was not defeated, and looking at its position and the amount of cannon, I was not surprised. It was sad to leave our apartment, it was well furnished and pleasant, but we must move on. The first stage was walk along the beach, a joy this time of the morning as it was warm and deserted. We crossed a lagoon area on board walks and arrived at a large parking area. This was Pobeña. There is an albergue here, but apart from this, nothing but a tap. We filled our bottles and gave thanks that we stopped early yesterday. There will be nowhere else to stay until Castro Urdales. From here there is a series of steps that take us up to an abandoned railway bed. For the first time in ages we have a bit of flat walking. Apart from not having to lug our gear up and down hills, I enjoy a bit of industrial archeology. We play tag for a while with the German couple who were booked into our apartments last night, but in the end, I think they have a faster pace than us and they loose us when we stop for coffee. At the end of the railway casement we have a bit of debate, the arrows are confusing, but the book says we must pass under the main road and the Germans go that way so we follow. We pass through Onton, the guide book says ” no facilities” and it was right. When we finally descended to the coast again, it was time to stop for some coffee and pastry. It would be nice to have something now and again that did not involve pastry or bread, it is playing havoc with our bowels. Fortunately we are out in the open most of the time. 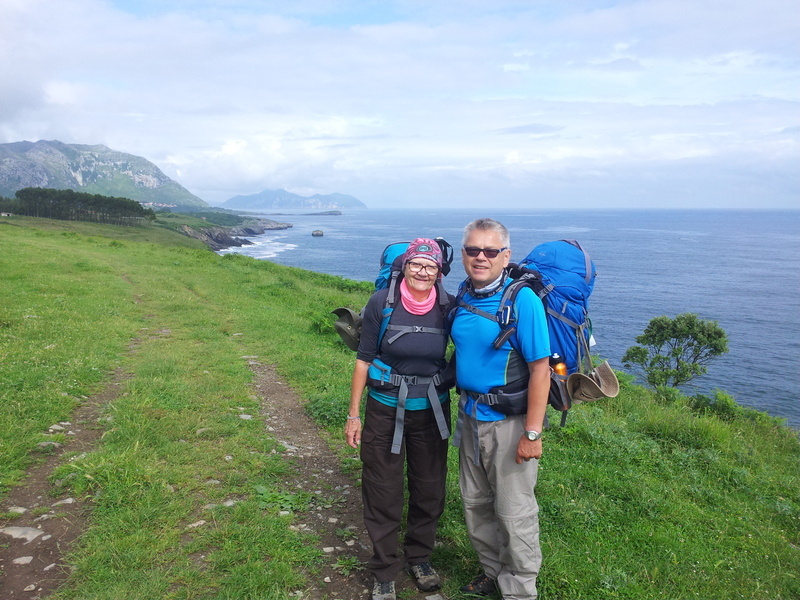 When we get into the outskirts of Castro Urdiales, we start to wonder if we will ever find lodgings. It is all big houses, not even a hotel. I think we do nearly 2k more before we come into a town. Time for a beer before we look for lodgings. Just inside the town area we find a lovely Pension, for only 30e. So we wash up loose the bags and go explore. We found a nice beach side bar that had menu, but we avoided all the fishy things. 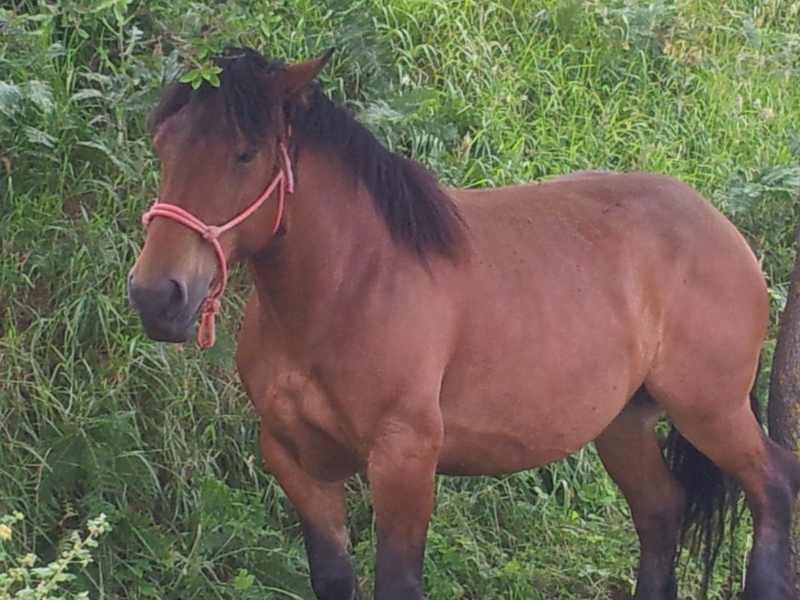 Today should have been 18.6k with the 1.1to Pobeña again we have done 3k more and we are still short of the alburgue. Not looking good for tomorrow then, the book says 35.4.